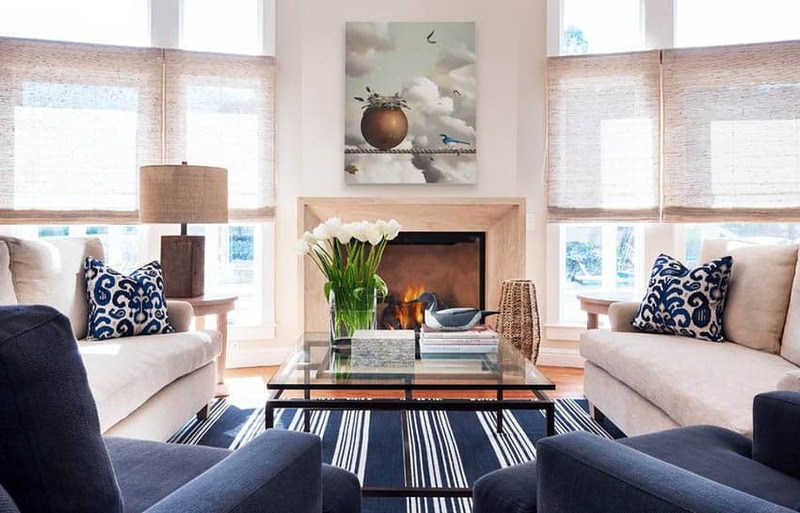 A beach themed living room on a budget is possible by focusing on the right design elements. Nothing invites you in to relax more than a living room with a coastal vibe. Even if you don’t have the budget for beach front views, you can have beach front style! Here are a few design pro tips on how to get beachy on a budget and create an environment that will remind you of the oceanfront any time of the year. Choose a large sisal or jute rug for a natural, beachy feel. Rugs made from these fibers are significantly less expensive than their wool or nylon cousins, so you can get a rug large enough to fill your space, even on a budget. The great thing about these natural rugs is that they are as durable as they are beautiful, are perfect for families, and are easy to clean. 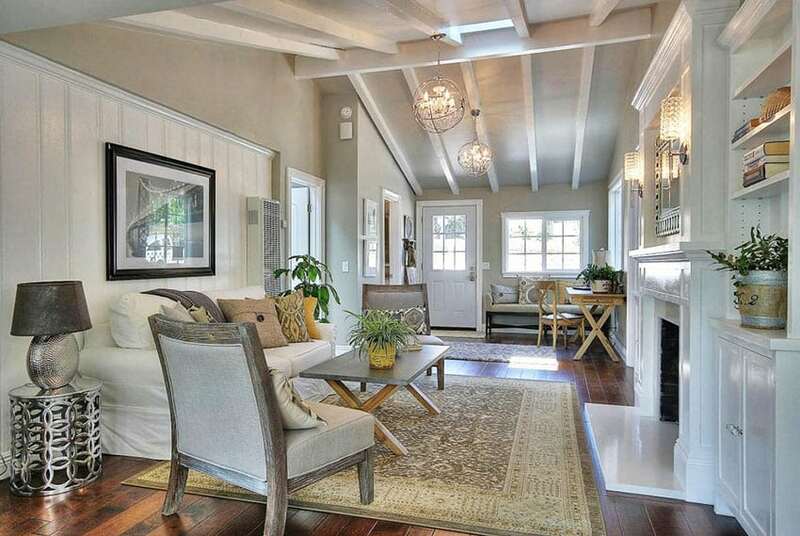 A sisal rug in a warm, sandy tone really sets the stage for a beautiful, beachy living space. If sisal and jute aren’t your thing, then you can get really creative with a little DIY and paint a floor cloth. All you need is canvas (an inexpensive drop cloth works great), paint, and a good water-based polyurethane to create a beautiful floor cloth that will stand up to years of wear and tear. The best thing about this budget perfect rug is that there is no limit on the design, you chose the colors, you can freehand or stencil your design. With a little creativity and some standard hardware store supplies, you can have a custom-made rug that sets the tone for your beach themed living room. Paint is one of the most budget-friendly ways to spruce up a space, you can use it on walls, furnishings, and even on your living room rug! 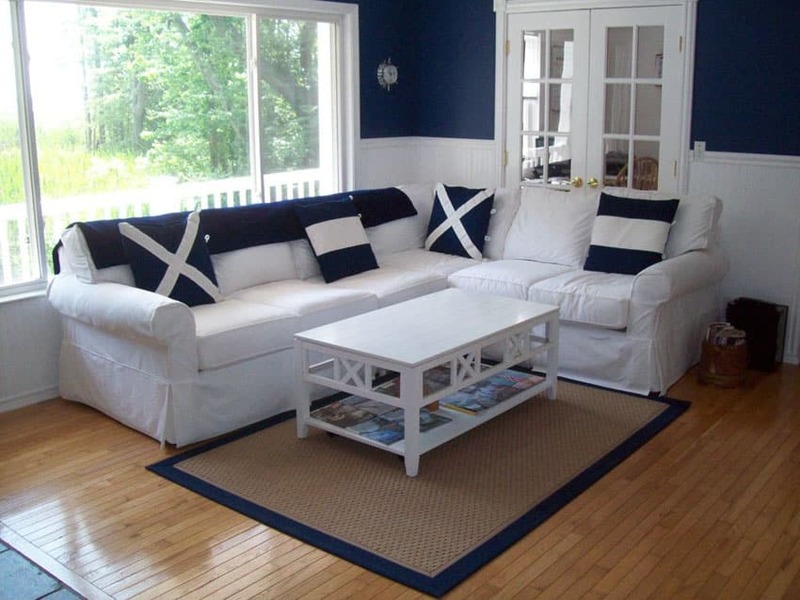 Blues and white are pretty standard fare for the beach themed living room. But think beyond blue and white to the grey-green of weathered wood, light amber of sea glass, the off-white of a sandy beach, or the rich green of kelp forests swaying gently in the sea. Take a walk along the beach or look at photos of beaches from around the world and let the colors of nature inspire you. To keep things light and bright, keep the tints soft on your walls, especially if you have a smaller room. Speaking of light and bright, what really makes a beach home special is the fact that they often have huge windows that let it natural light and make best use of those beachfront views. Keep your window coverings light and airy to take advantage of all the natural light that you get. A large mirror will help bounce light around the space, giving the illusion that there are more windows. And make sure to have plenty of lamps and good ceiling lighting in your space. Accessories, the jewels of the home, can really bust a budget if you aren’t careful. And it is so easy to get caught up in ALL. THE. THINGS! The best way to stick to a budget is to plan what you want in advance. When you decide to do a beach themed living room, start a dream board, Pinterest board, notebook, whatever visual organization that you prefer. Just start collecting images of items that you love that are within your budget. Choose on statement piece and a few accents. If you want your space to look professionally designed, remember this rule of thumb, quality over quantity. That doesn’t mean that you have to choose expensive items, but if you fill your space with several cheap items, it will just look like clutter. Found objects, such a sea glass and driftwood are a great budget-friendly solution. Three inexpensive glass jars of different sizes, one filled with long sticks of driftwood, the other two filled with sea glass, look amazing on a bookshelf and keep your eye moving through the space by carrying the beach theme throughout the room. A pretty wooden bowl found at a yard sale or funky recycle shop filled with seashells looks great on a coffee table. Add a stack of comfy floor pillows in linen or canvas, easy to DIY with inexpensive pillow forms, a couple of yards of fabric, and acrylic paint, and you have a great beach themed design. Chances are that you aren’t going to want to go out and purchase new furniture, and that is okay. The beachy vibe that you want is lived-in and weathered. It is soft and worn and comfortable. If you aren’t up for the DIY madness of reupholstering your furniture, look to slipcovers. 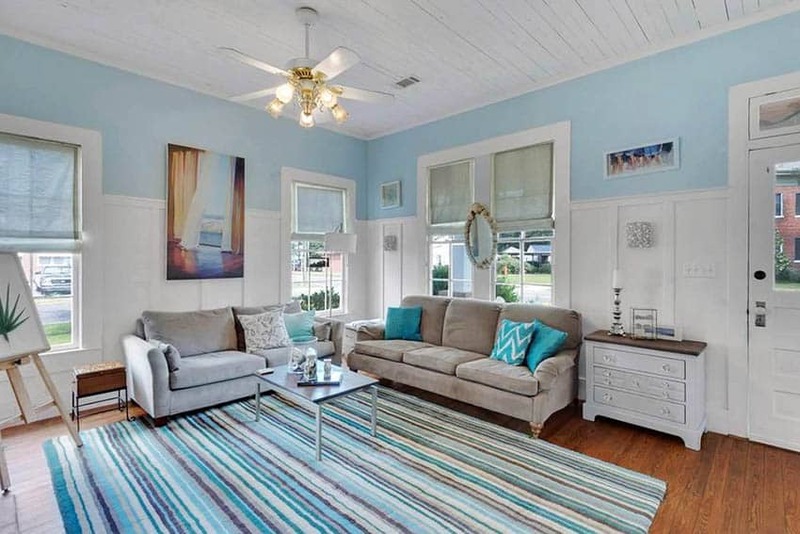 A light denim or chambray slipcover in a light sky blue will give you instant beach house feel. It will be comfortable and soft and will get even softer with washing. Speaking of washing, here is where the slipcover becomes a true budget buddy, many of them are washable! If your sleepover-loving ‘tween has a few friends over and they spill their rainbow unicorn milkshakes on your sofa, no problem. Just pop that slipcover in the wash and strongly hint that it is the friends turn to host the sleepover next time. Unbleached muslin is the perfect color for a beach themed living room. A soft off-white, reminiscent of oats, muslin is inexpensive, durable, easy to wash, and comfortable. If you want to sew your own, muslin is one of the cheapest fabrics that you can buy and is easily to find at any sewing and crafts store. Jazz up your sofa or chair with throw pillows, either DIY or purchased from any big box store for a reasonable price. Wood, wood, wood. Along with all that water, we always think of wood when we think of the beach. Weathered cedar shingles, driftwood, the painted hulls of old boats, wood siding worn by the salty air, teak ships, and wooden treasure chests. Bring this wood into your living room to complete your beach themed living room. Scour yard sales and recycle shops for solid wood furniture that has seen better days. Paint it white then sand it down to look worn or remove all the stain and leave it natural and let it develop a patina over time for a classic, shabby beach chic look. Or paint it bright, glossy white for an updated modern beach vibe. There are several furniture hack websites that have fantastic DIY tutorials for hacking new, cheap furniture from big box stores to look weathered and beachy. 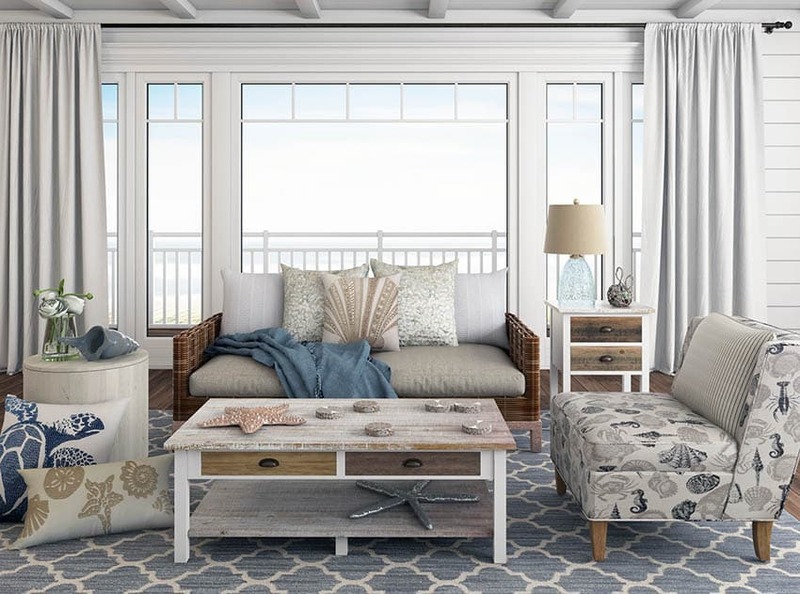 When it comes to beachy design, you can go nautical with bright blue and white, natural with sandy tones, blues, and greens, or modern with navy, eggshell, and bright red. Regardless of your beach style, you can have a beautiful, beach themed living room on a budget. With a little bit of time, creativity, and thought, you can find solutions to every budget-busting design dilemma, and come away with the beach themed living room of your dreams.